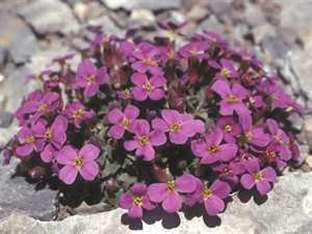 Dwarf Rockcress is a favorite spring flowering perennial covered with magenta-purple flowers from mid spring to late spring. It forms a mound of deep green, semi-evergreen leaves growing to a height of 2" to 4" tall and 6" to 12" wide. Plant Dwarf Rockcress in full sun to partial sun in well drained soil.